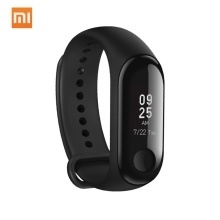 The Xiaomi Band 3 with 0.78-inch OLED color screen and fashionable design, records the sports&apos;data, intelligently reminding functions and monitoring your basic body situation, helps you know the important data in time and monitors your health data to maintain your healthier body. That screen is a 0.78-inch OLED panel with a resolution of 128*80P, which considering the size of this display and what you&apos;ll need from a fitness tracker should look great on your wrist. The whole fitness tracker is waterproof up to 50 meters, which is some of the best waterproofing we&apos;ve seen on a wearable and will mean you&apos;re able to take it swimming and in the shower too. It has BT 4.2 technology inside and it&apos;ll be able to work with both Android 4.4 and above phones as well as iOS 9.0 and above. The battery inside the Xiaomi Mi Band 3 is a 110mAh cell, which the company claims will last around 20 days standby time from a single charge. There&apos;s also a sleep tracking feature onboard that should be able to give you basic stats on your sleep quality. You&apos;ll get limited notifications such as your incoming calls, text messages and certain messaging apps. And you&apos;ll be greeted with your WeChat or QQ messages in China. Global Version: Default language is English, also support multi-language, including English, Spanish, Russian, French, Korean, German, Italian, Polish and so on. NOT support Korean, Turkish and Hebrew. 1. Please search "Mi fit" in Google play store or App store to download the App.